Wrath is among our favorite small family producers in Monterey. Most of the wines are sourced from Wrath’s own 72-acre estate, San Saba, which produces fresh and crisp grapes from a cool site with little rainfall situated just below the Santa Lucia Highands AVA. The wines reviewed here are from the Ex Anima, Winemaker Series and Single Vineyard Series each offering delicious wines at favorable prices. Wrath 2013 Chardonnay San Saba Vineyard Monterey ($49) 92 The Chardonnay San Saba Vineyard is sourced from Wrath’s 72-acre estate vineyard located just below the Santa Lucia Highlands. 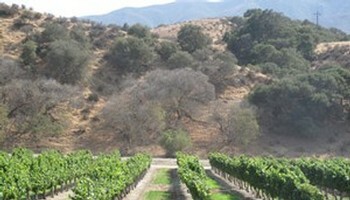 A cool site with little rainfall, it produces wines of richness and intensity of flavor. This Chardonnay offers orchard fruit and minerals on the attack and the mid-palate, followed by notes of toasted oak. Aged 10 months in French oak, 50% new, it is beautifully balanced with a persistent finish. Wrath 2014 Ex Anima Chardonnay Monterey ($19) 89 This is an easy drinking Chardonnay offering aromas of melon and minerals. It is nicely textured with good acidity and freshness and a long persistence finish. Fermented in stainless steel and sees no oak. Wrath 2013 Grenache Alta Loma Vineyard Monterey ($35) 90 This Grenache is dark in color with a rich collection of intense high toned red-berry fruit. It is sourced from the biodynamically certified Alta Loma Vineyard which sits on a hillside just south of the Santa Lucia Highlands. Aged 10 months in French oak, this bottling is nicely balanced and a pleasure to drink. Wrath 2013 Pinot Noir KW Ranch Santa Lucia Highlands ($49) 92 The Pinot Noir KW Ranch is an elegant wine sourced from one of the finest vineyards in the Santa Lucia Highlands. The wines from the KW Ranch tend to be highly aromatic and rich in red berry fruit flavor. This one offers red berries and cherries with hints of herbs and toast. A beauty blended with equal parts of Pommard 4 and 667 clones. Wrath 2014 Pinot Noir Ex Vite Monterey ($38) 89+ This is an easy-drinking Pinot Noir fermented in stainless steel and aged in neutral oak. It offers fresh aromas of dark berry and cherry and underbrush with touches of earth and loam. The palate is nicely balanced and has a persistent finish. Wrath 2013 Pinot Noir Swan/828 Monterey ($49) 92 This is a fragrant Pinot Noir that exhibits ripe aromas and flavors of red berries and cherries. It is also slightly earthy in character with good density of flavor. Aged 10 months in 50% new French oak, it is nicely integrated with a hint of mint. Wrath 2013 Syrah San Saba Vineyard ($35) 91 The Syrah San Saba Vineyard displays a dark ruby color with aromas of earth and black berry fruit. It has a hint of black pepper, herbs, and toasted oak. Aged 10 months in 66% new French oak, it is one of the finest examples of Syrah in the region. Wrath 2013 Syrah-Grenache-Cinsault Destruction Level Monterey ($35) 93 The Wrath Destruction Level is an attractive blend of 45% Syrah, 45% Grenache, and 10% Cinsault. It offers rich flavors of black berry and smokey oak. While Syrah is dominant, the cuvee offers hints of red berries and spice. Aged 10 months in neutral French oak. This entry was posted in California, Chardonnay, Pinot Noir, Red Wine, Uncategorized, White Wine and tagged Monterey, Sana Lucia Highlands. Bookmark the permalink.